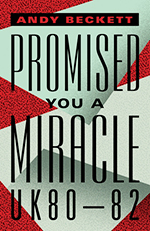 SPERI is delighted to welcome Andy Beckett of The Guardian, for the Sheffield launch of his new book: Promised You a Miracle: UK 80-82 which explores the politics and economics of what he considers to be the two critical years in the formation of modern Britain. Andy also writes for The Economist, The New York Review of Books and The London Review of Books and was the author of When the Lights Went Out, his account of the turbulent 1970s in Britain. Copies of his new book will be available for purchase on the evening. Two other speakers will briefly introduce Andy’s new book to the audience before he explains why he wrote it. They will be: Dr Kate Dommett, Deputy Director of the Sir Bernard Crick Centre at the University of Sheffield; and Professor Stephen Farrall, Professor of Law at the University of Sheffield.